1-Restart your Mac. Simply restarting your Mac may fix this issue. To do this, choose “Restart…” from the Apple menu. Hold down the Option and Command keys on your keyboard while you launch iTunes. iTunes will start in Safe Mode. You will be a pop up message saying “iTunes is running in safe mode. Visual plug-ins you have installed have been temporarily disabled.” Click “Continue”. If iTunes is working properly without any issue in safe mode, a third party iTunes add-on is causing this problem. iTunes add-ons can be found in this folder: ~/Library/iTunes/iTunes Plug-ins/. To find out the problematic add-on, close iTunes, and move the add-ons to your desktop one at a time temporarily. You may also want to contact the developers of your plug-ins. Maybe, there are updates that you can install. 3-Make sure that you have the latest version of iTunes installed. If you do not, please update iTunes. You can update iTunes in a few minuets. 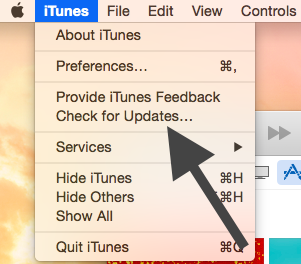 Launch iTunes then, from the menu, select iTunes > Check for Updates. 4-Turn off Wi-Fi. Then launch iTunes and sign out by going to iTunes menu > Store > Sing Out then quit iTunes. Then turn on Wi-Fi and relaunch iTunes. Launch Terminal. The Terminal app is located in the Utilities folder (Applications folder). Enter your password when/if you are asked, then press the Return key. This command will remove iTunes from your Mac immediately. Now reinstall iTunes. Simply go to the iTunes download page, and download the installer to your hard drive and after your download, then double click the itunes.dmg file to install. Tried all this.. iTunes is still unresponsive as in veeeery slow. Thank you. Suggestion 4, turning off WIFI did the trick. First, I force quit iTunes, which was open but I couldn’t see any windows or even the menu bar. Then I clicked “Option” while re-opening the iTunes app on my Mac. It asks for you to choose an iTunes Library to start from. I clicked on mine (iTunes / iTunes Library.itl), and it took a minute to (presumably) rebuild my library database. Thanks! Option opening iTunes worked for me too. I tried all the complex suggestions with no success. Itunes even froze in safe mode. Turning off wifi worked. There sure are a lot of bugs in the current OS. None of the proposed remedies worked in my case. #3, in particular, would not work since I could not launch iTunes to check for updates. Fortunately, the latest Mac OS update, which includes iTunes v.12.7.1.14, did the trick. followed the instructions for removing iTunes… when i get to the prompt to enter my password, I am unable to. There is a key symbol which does not allow any typing. Totally stuck and NONE of the suggestions work. Please help! Did you ever find a fix for this? I am having the same issue. I’ve tried everything. Every time I open iTunes, it goes into fullscreen and freezes. It gives me the wheel of death and I have to force quit it. I have no idea what to do. Please help me. I reinstalled as in solution 5 and it worked fo me. Thank you! Thank you so much! I used your #4 suggestion, and it opened my Itunes. However, all my music was gone and I had to reload the Itunes folder. No worries, you were a big help! I actually went through all the step and finally ended up having uninstall and reinstall the iTunes app as described. once I was done I clicked on the iTunes app and it instantly opened! Oh I am so relieved that I finally got it up and running. These steps were easy and quick to go through. Thank you for posting the information, it was very helpful to me. Thank you, suggestion 5 work perfectly !